StashMyComics.com is the leading free comic book and action figures cataloging website, sporting a growing comic book and action figures database with information on hundreds of thousands of comics and action figures. Sign-Up for free and you will be stashing and organizing your comics and action figures in less than a minute. No hidden costs, no premium services. StashMyComics.com is completely free across the board, no catch, no gimmick. An original comic from one of our own, Chip Reece. 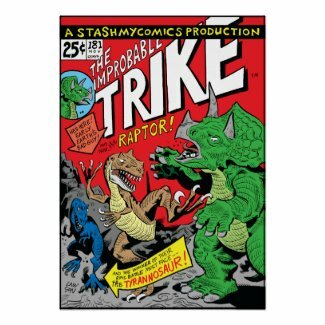 To celebrate our 10th year we got Jim Lawson, ye that Jim Lawson, the artist of The Teenate Mutant Ninja Turtles, to do an original artwork called "The Improbable Trike #181". The Improbable Trike is a parody of the infamous Incredible Hulk #181. Check out this poster and shirt featuring the artwork and you can find more products at our shop. We will be adding more products and variants, but don't wait, go grab some merch. This was a wonderful collection of stories celebrating one of my all-time favorite looneys.